Smart metering using IoT has the potential to increase efficient use of utilities and identify and resolve issues in supply infrastructure in the utility industry. One definition of smart metering is the collection of metering data on utility (electricity, water, gas) use, and the systems and processes that derive value from the data. It also enables two-way communications from the meter to utility providers and users, and involves intelligence and processing within the meter that differentiates it from simple automated meter-reading systems that send a reading at specified intervals. Smart metering is widely used in the electrical power industry, due to ready availability of power for IoT devices, however has proved more challenging in metering other utilities such as water. Smart meters enable users and suppliers to gain insights into the utility use of a particular site, piece of equipment, house: anything with a meter. It also gives electricity distribution or water network operators insights into the operation of the network. On the supply end of the meter, utility providers can start to understand what demand is on the network, and when and where there is demand. As with any IoT project, the cost of smart metering solutions needs to be offset by efficiency or cost savings driven by value extracted from the data collected. One key to increasing efficiency with smart metering is to provide customer friendly data visualisation, interactive analytics and data sharing to allow users to monitor and modify their utility usage. This may not be necessary for corporate users, who will require integration of smart metering data with their own business systems to drive economic and operational benefits. Enrichment of data with additional sources (such as weather and home automation data) also adds value, as does automating processes and work flows by feeding smart metering data or summaries into scheduling, reporting and service systems. Monitoring water use can also businesses predict future utility use for more informed financial planning. The water industry has historically lacked economically IoT solutions for smart metering. Only around one percent of residential water meters (95% of the water market) are smart enabled. However the application of IoT technologies to high water users is now delivering significant results. Low cost, high volume remote sensing devices are using new low power wide area network (LPWAN) communication technologies and advanced data analytics to develop new business models for the management of water use. Users are more easily able to identify water leaks and consumption trends, to generate insights and facilitate smarter action. These components and their relation to each other are shown in the diagram below. Machine learning is used to improve the efficiency data analysis, especially for large data sets for cities rather than individual buildings. Integration of smart water metering systems with operational and business systems is a developing area, as historically they have been stand alone systems rolled out by water utilities with links to billing and some data analytics. Future developments are likely to include data connections to systems that schedule maintenance work, and automatic alerts to operators to resolve detected water leaks. Smart water meters distinguish baseflow (constant, steady flow) from leaks (steady or slightly fluctuating use of water which varies from the norm). Data analysis can inform other efficiencies including timing of air conditioning operation to maximise efficient use of cooling towers. Leak detection provides the greatest economic benefit of smart water metering. A recent project delivered water savings that covered the cost of smart meter installation in less than a year. The diagram below shows the increase in water usage (dark blue line) caused by a leak in the roof sprinklers during the new year’s break at a facility. An automatic alert sent by the smart metering system allowed the leak to be detected and fixed in a matter of days. Challenges to IoT smart metering solutions can be industry specific. For example, the water industry has infrastructure, such as underground pipes and meters, that are very difficult to access and successfully establish data communications with. This has historically made implementation of IoT and other electronic solutions (end-to-end telematics, SCADA) solutions challenging, as they require deployment of devices with access to power and communications channels. Prototypes are being developed for Sigfox smart metering devices outside North America and Europe, as the frequencies vary between regions, and smart metering devices have not been widely used outside these areas. There is also a limited amount of knowledge of developing smart metering applications for IoT, particularly in the water industry, so collaboration with professional organisations and between developers is important. Another challenge is educating utility users that installing a smart metering system will not increase sustainable resource use unless there are clearly defined goals and methods to store, analyse and feed data into decision making to change behaviour to maximise efficiency. To do this, smart metering systems need to be integrated with business or operational systems, which can be challenging as some utilities (eg. water), currently have limited standards to aid integration of IoT data. Security of smart metering systems is also a concern, particularly for government run systems. This can result in private servers being set up rather than hosting smart metering data in the cloud. Data ownership and privacy are also challenging, particularly for sharing of data collected from private homes. Australian smart metering company WaterGroup has formed a partnership with IoT communications provider Thinxstra to use the Sigfox LPWAN to allow high water users to detect leaks, and has received an award from the Australian communications industry for positive application of IoT technologies. 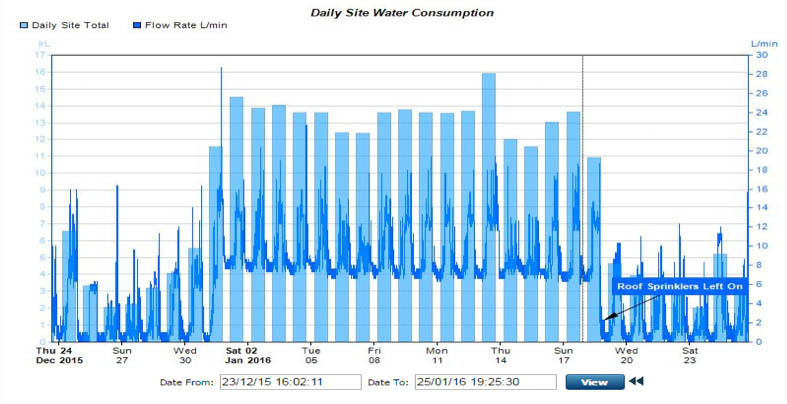 Over the past few years, South East Water (SEW) in Victoria have been trialling a range of different Internet of Things (IOT) technologies with the goal of creating the most advanced water and waste water network in Australia. The trials are aimed at identifying an IOT platform that will allow the connection of around one million monitoring and controlling devices across SEW’s water and wastewater network using a low power wide area network. More information is contained in the case study page for this project. The Australian national data standard standard for energy smart metering is NEM-12, administered by the Australian Energy Market Operator (AEMO). Standards for IoT-based smart metering of water are still being developed. There is no standard format data storage and transfer, so there are many different file types and formats, which are difficult to integrate. Middleware software can be used to convert data into a common format for integration. Other areas for development in IoT smart water metering data standards include reliability, communications protocols and security. IoT smart metering applications in Australia also use the Hypercat standard for cataloguing and storing IoT data.